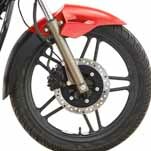 Front & Rear Brakes - Hero MotoCorp Ltd. The master cylinder/ reservoir is located behind right side cover next to the battery. Check for the correct brake fluid in the master cylinder. 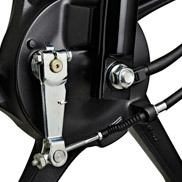 Ensure that the brake fluid level does not fall below "MIN'' mark on front brake master cylinder parallel to the ground. The level decreases gradually due to piston movement to compensate pad wear. If the level decreases abruptly, check for the leakages in the brake system and consult your Authorised Hero MotoCorp workshop. Clean the dirt and mud accumulation between the brake pads caliper and the disc by using a water jet. 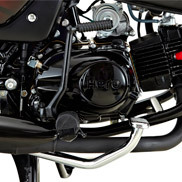 Always contact your Authorised Hero MotoCorp workshop for refilling of master cylinder when necessary. Do not mix DOT 3 and DOT 4 brake fluid. Park the motorcycle on its main stand. Measure the distance, the front brake lever moves before the brake starts to take hold. 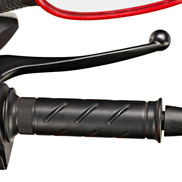 Free play should be 10-20 mm at the tip of the brake lever. If adjustment is necessary, turn the adjusting nut. 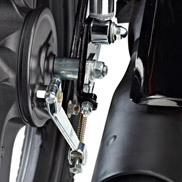 Make sure that cut-out on the adjusting nut is seated on the brake joint pin after making final free play adjustment. Apply the brake several times and check for free wheel rotation when released. 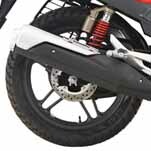 If proper adjustment cannotbe obtained by this method, visit your Authorized Hero MotoCorp workshop. Measure the distance of brake pedal moves before the brake starts to take hold. Free play should be 20-30 mm. If adjustment is necessary, turn the rear brake adjusting nut. Make sure that the cut-out on the adjusting nut is seated on the brake joint pin after the final adjustment has been made. Brake pad wear depends upon the severity of usage, the type of riding & road conditions. Generally, the pads will wear faster on wet & dry roads. Inspect the pads at regular intervals. Check the brake pads for wear by examining the wear limit groove on each pad. If either pad is worn to the bottom of the grooves replace both pads as a set. Visit your Authorised Hero MotoCorp workshop for this service. Always apply front and rear brakes simultaneously to avoid skidding of vehicle. 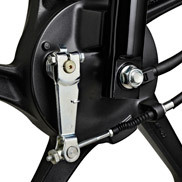 When the brake is applied, an arrow fixed to the brake arm moves toward a reference mark on the brake panel. 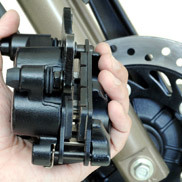 If the arrow aligns with the reference mark on full application of the brake, the brake shoes must be replaced.